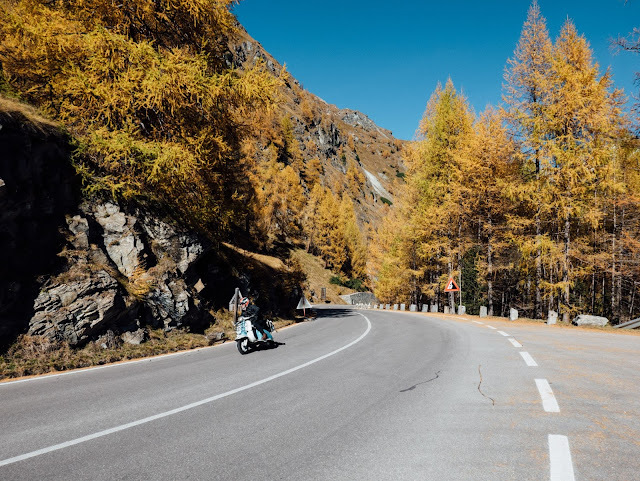 since I had found out about Grossglockner Hochalpenstrasse, a panoramic road in Austria which, on paper, seemed a wonderful way to spend one of our lambretta weekends away, I've been hoping to find a lovely autumn day to enjoy it to the fullest. good weather was an indispensable requirement to confront the long road and the highest mountain of Austria. since we were planning our little trip for mid-October, of course we weren't completely sure we were actually going to leave until the day before: we checked the weather forecast everyday that week, but even when the nice symbol of the sun steady showed up on our screens, we've never dreamt we'd be so lucky! we have ridden through Austria's highest scenic road on the best autumn day you could imagine, with blue cloudless sky and a view made of stunning mountain peaks, snow and those amazing warm tones that you can find during October in the Alps.